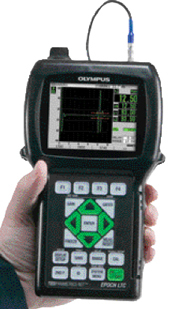 Olympus NDT Inc., Waltham, MA, has introduced the Epoch LTC digital ultrasonic flaw detector. Weighing only 2.12 lb., this handheld instrument is the smallest in the line of Epoch flaw detectors. The detector is built for use in difficult inspection environments. Its sealed case meets IP67 requirements to withstand wet or dusty environments while the multi-color transflective LCD with full VGA resolution provides readability from bright sunlight to complete darkness. The unit also features a simple keypad that allows control from the left or right hand for direct access to all functions. The Epoch LTC provides standard measurement features and specialized software options to find internal defects in a variety of materials. The instrument is EN 12668-1 compliant and features a square-wave pulser, selectable digital filtering, gain range from 1 to 110 dB, peak memory, 0.001 in. measurement resolution and one gate with programmable alarm. Dynamic DAC/TVG software is standard with the unit and application-specific software options include DGS/AVG flaw sizing, manual PRF control, extended range, tunable square-wave pulser, curved surface correction and AWS D1.1/D1.5. The detector provides internal storage of inspection data of 50,000 IDs with waveform and measurement parameters while a card slot provides additional storage. Its onboard USB port facilitates rapid transfer of data and the VGA output allows viewing of the waveform display on remote computer or projector screens. The Epoch LTC comes standard with AC adaptor, transport case, hand strap and lithium-ion rechargeable battery.